Culinary delights, first-rate entertainment and outdoor adventures might just have you heading to the west coast this autumn. Fall adds a splash of colour to the many attractions of this historic city, including the many garden and woodland sites. Voted one of the Ten Best Public Gardens in Canada by Canadian Geographic Travel, Milner Gardens and Woodland is alight with colour this time of year. Many of the gardens are still in bloom, and the forest displays much of its fall splendour. There are also numerous parks and trails that “show off” their colours during the September and October months. For instance, fall is reputedly one of the best seasons to experience Beacon Hill Park. 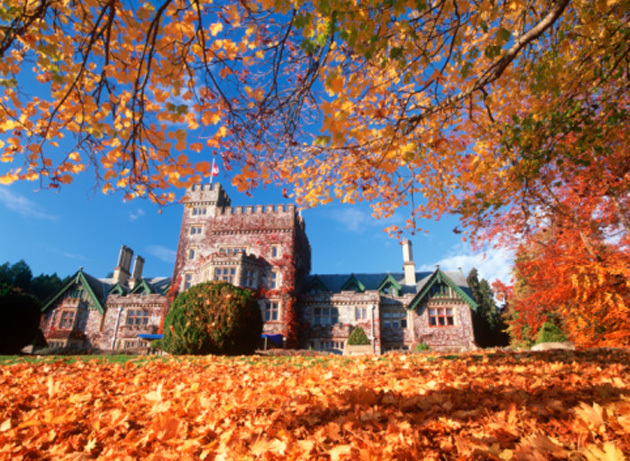 Hatley Castle is also afire with colour this time of year and a great setting for some romantic fall photos. If you enjoy historic architecture, both Hatley Castle and Craigdarroch Castle offer self-guided tours. Elsewhere, there are dozens of other events happening this fall, including a wide variety of wine and food festivals. For a complete list of what’s happening, see the Calendar of Events. 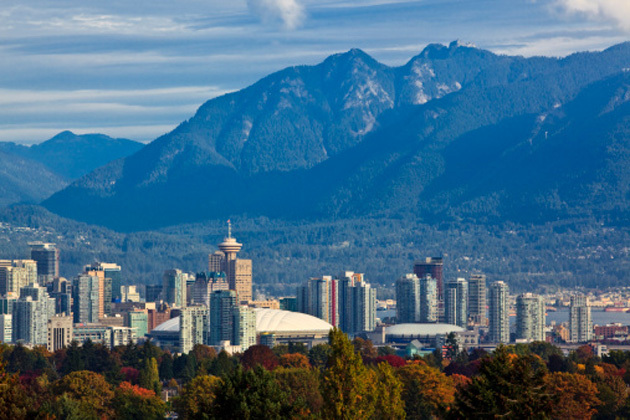 There’s a little of something for everyone in this Olympic host city. If the mountain vistas, coastlines and the city’s famous Stanley Park aren’t enough to tempt autumn visitors, the harvest season is an ideal time to treat your palate. The region is famous not only for its local brews but also its ciders and wines as well. Visit some of the local breweries and cideries and keep your eyes open for seasonal brews like pumpkin beer. For a late fall getaway, scotch and whiskey lovers won’t want to miss the Hopscotch Festival held in mid-November. Star-gazing is also a popular pastime with many feature films and TV shows being produced in the area. To see what’s going on, visit the BC Film Commission website. And if you’re feeling daring, take a stroll across the Capilano Suspension Bridge spanning 450 feet across the river at a height of 230 feet. The park’s newest attraction, appropriately named Treetops Adventure, is a network of bridges among the treetops of this coastal rainforest. 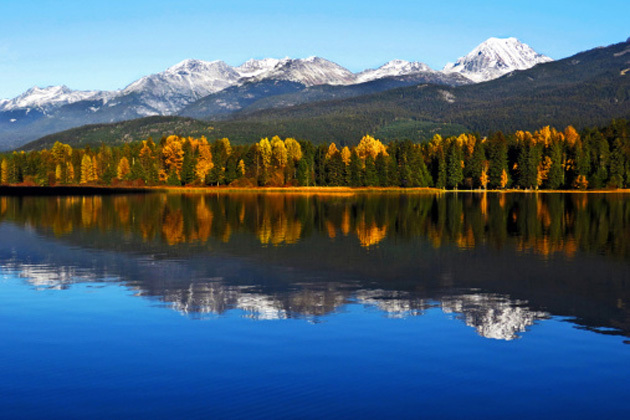 In the fall, the Whistler area has much to offer travellers looking for some rest and relaxation — including some great off-season deals. The pedestrian-only village, nestled between Whistler and Blackcomb mountains, is a great place to start. Stroll around to visit the 200 stores or 90 restaurants, and the Farmers’ Market has seasonal fare along with local arts and crafts. There are also several art galleries with free admission, and other museums and sites to visit. Pamper yourself a little while you’re at it. There are more than 20 spas in the area that cater to male and female clientele — perfect for a ladies-only vacation or a couples’ retreat. Some studios in the area even offer drop-in yoga classes. For some physical activity, the area has a number of golf courses worth a visit (and a few rounds are often included in many fall hotel packages). The Valley Trail affords some postcard-worthy photo opportunities, and every Wednesday visitors can join the Whistler Kayak Club for some time on the water at Wayside Park. After a short ride on the WAVE (local transit), the Interpretive Forest takes you on a self-guided tour through an old-growth forest for an educational afternoon out of doors. For more free activities, visit the tourism bureau’s website. 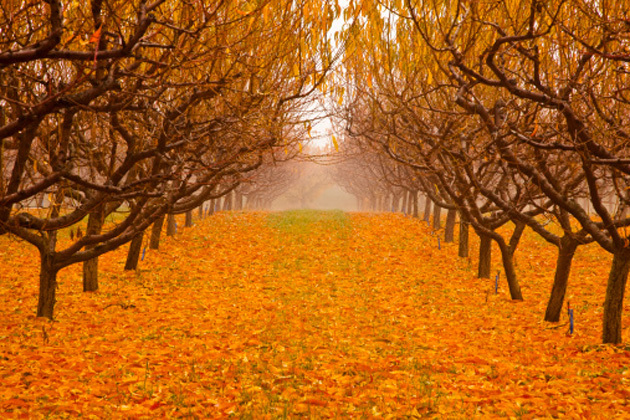 Autumn is all about the wine in the picturesque Okanagan Valley where some of Canada’s best wines are produced. Imagine plump grapes ripening on their vines against a backdrop of the mountains and Okanagan Lake. The area also hosts one of the few North American wine festivals held during the thick of the harvest. The Okanagan Fall Wine Festival features over 165 events including winery tours, tastings and awards. The area is also popular for its scenic golf courses, but an adrenaline rush is to be found on the race tracks. With the Okanagan Racing Experience, you can don a fire-proof suit and helmet and put “the pedal to the metal” (after some lessons, of course). 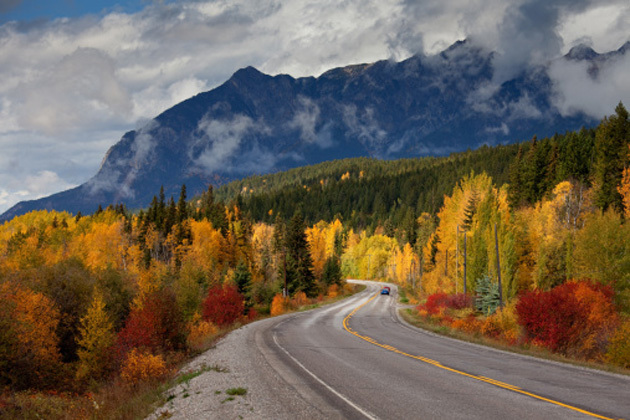 If you’re looking for ways to get around, there are a number of travel excursions in British Columbia and Alberta that show off the colours. For example, VIA Rail’s train vacations offer mountain and canyon vistas alive with colour — at a cooler and less crowded time of year. If you know of a great place to visit or a great event others won’t want to miss, we invite you to share it in the comments below.